Makeup is not my strong point–I wear my face bare as often as I can. I stay away from bright colors in favor of neutral tones that look like my skin, but better. I got my first set of makeup when I was a senior in high school so I could wear something to prom and since then my Sephora points have never topped 500. But Hi Wildflower doesn’t hold it against me. 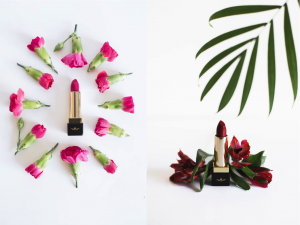 Hi Wildflower is a perfume and cosmetics brand founded by the novelist Tanwi Nandani Islam with the intention of bringing bright colors to a melanated makeup-wearer. It’s brilliant. Not only do all their products have transporting, effervescent names (obviously the most important part when selecting makeup) but their colors are pigmented and rich. I received my first Hi Wildflower products through an Instagram giveaway, and though I had been somewhat aware of Islam and her gorgeous brand, I hadn’t tried any of her mixtures till a few months ago. After getting each item, all of which were lovingly wrapped in velvety black boxes with gold foil that make you feel like a Grand Dame, I had to take a minute to just soak them in. Islam has done a wonderful job designing each piece, each lipstick canister boxed in black velvet-matte smoothness, the nail polish bottles with their gold, weighted handles, and elegant crystal perfume vials to evoke a timeless, floral feel. Each piece is garnished with Hi Wildflower’s iconic logo. Keeping them on my makeup shelf makes me feel like a starlet from the 1940s. Hi Wildflower lipstick canisters. Photo courtesy of author. 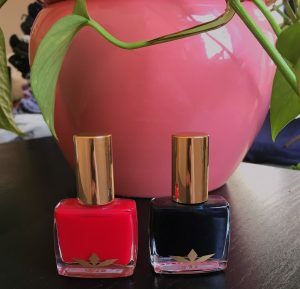 In the giveaway I got two perfumes, Namaka and Mojave, and two nail polishes, Midnight at Joshua Tree, a creamy green-black, and Veranera, an almost magenta-red. I also received two lipsticks, the purpley-red Mala and the bright pink Gulabi Gang. 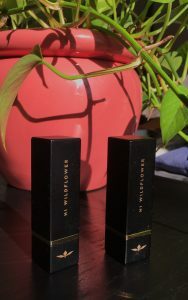 Hi Wildflower started with their fragrances, it’s what they’re most known for and the ones I received did not disappoint. Namaka reminds me of walking into a mandir at the height of a pooja, swirling fire mixed with fresh, crushed flowers. It’s such a deeply evocative scent for me of a childhood spent inhaling the distinctive smells of gifts brought back from India that I have to wear it sparingly, otherwise I lose the thread of what I’m saying. It’s extremely comforting. Mojave is pure and breezy, it smells like the wind and rain. I feel like a walking thundercloud when I wear it, overtaking your senses and abundant. Since both scents are so strong, I haven’t felt the need to reapply them throughout the day, but the rollerball does make the perfume portable. 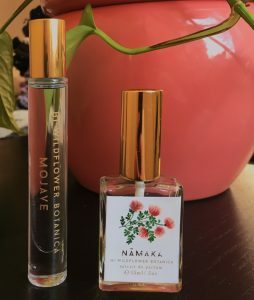 HI Wildflower perfumes, Mojave (rollerball) and Namaka (atomizer). Photo courtesy of author. Gulabi Gang was the first lipstick I tried since I normally stay away from pinks. Best to dive deep, you know? Pinks have never looked good on me. With my brown skin they always seemed to stick out from my face as too bright or too wispy, never quite right. Hi Wildflower’s Gulabi Gang has converted me. It’s the right pink, which was a surprise. I don’t know how else to say it, it’s just right. Both Mala and Gulabi Gang are stains. Gulabi Gang stood up to a day of eating and drinking with only minor touch ups needed. For my makeup-free life, that’s perfect. Low maintenance while still making an impression. Mala was also very pretty though it’s in between coloration caught me off guard, since it’s bolder than anything I’ve worn before. I need to keep working with it to see if I like it. HI Wildflower lipsticks, Gulabi Gang (right) and Mala (left). Images via Hi Wildflower. Hi Wildflower’s nail polishes are amazingly saturated. I only needed one coat of Veranera to get the color I wanted—a bright, shiny jewel red with a little pink. Midnight at Joshua Tree took two coats to go from a jewel green to a deep green. I like the mutability of these colors, they give options for multiple looks. I used a top and bottom coat though to keep them from chipping too easily, as I would with any other nail polish. Hi Wildflower nail polishes, Veranera and Midnight at Joshua Tree. Photo courtesy of author. For my first foray into Hi Wildflower’s goods, I am extremely satisfied. Their products are beautiful and compliment my skin tone in a way I don’t normally see—Islam obviously takes great care with her products. The perfumes are intense and unique, I doubt I’ve seen any other brand tap into these concoctions with the same intensity. I’m excited to see what products the brand will bring out next. Visit Hi Wildflower for more.